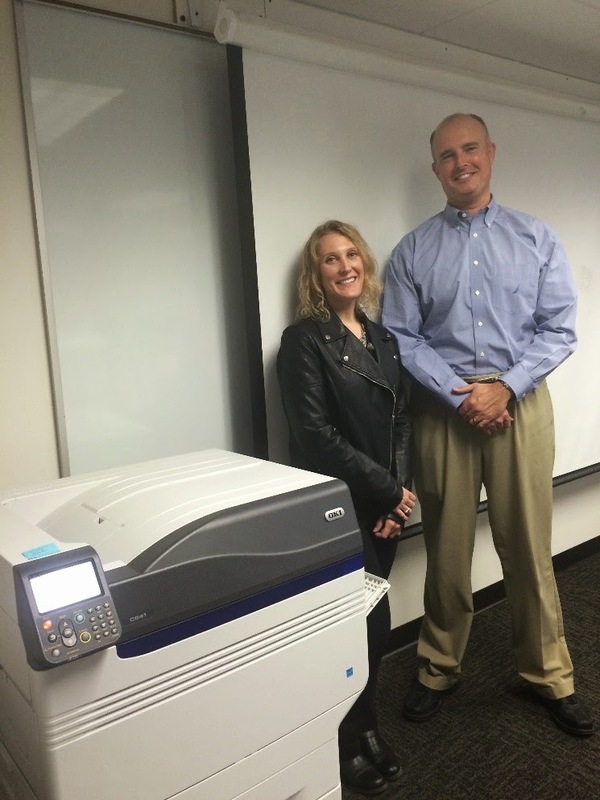 The subject line of the email read, “Art Institute of Philadelphia Announces Collaboration with OKI Data Americas to Integrate Printing Technologies into Curriculum.” When I saw this press release back in August, I couldn't help but become immediately intrigued. Four months later, this interest and many helpful parties led me to an inspiring personal visit to the site of this collaborative effort. The specific OKI printer involved in the collaboration, the graphic-arts-oriented C941dn, is out of my normal range of home and office (and more recently mobile) printing. The application area, again, graphic arts, is also beyond the majority of my most direct industry experience. The other parts of the equation, however, were absolutely compelling to me, as both a story for my readers and a situation I personally wanted to tap into. And something that IS on my regular beat and that gives me plenty of latitude as far as exploration is the future of printing, so this collaborative effort was of high interest. The direct involvement of college-age students promised to offer great insight into “the next generation” and its views on print. Throw a few pieces more on the practical side – the fact I am a frequent visitor to Philadelphia and surrounding environs, and as evidenced by my part-time professor role of the last few years, I really enjoy being around students - it seemed like a natural to request a visit to the Art Institute of Philadelphia and to see the printer (and its users) in action. OKI Data and its representatives were more than accommodating, and before I knew it, they had set me up for a pre-Thanksgiving visit. I am excited to report a few of my findings here. Observing Products in the Field – A Great Idea! 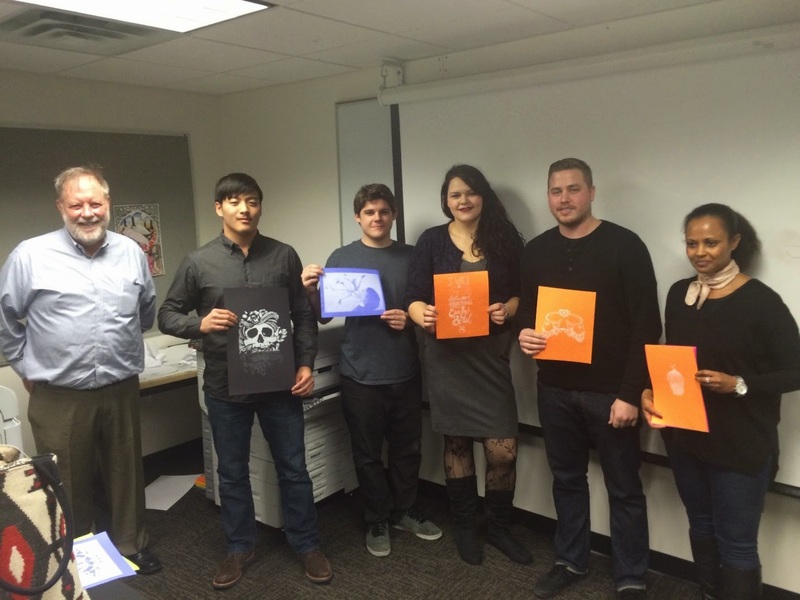 Yours truly with students (and their designs employing the white toner) - from left to right - Parker May, John Dzwonar, Erin McConche, Joe Kolodi, and Johanna Mannervik. As a long-time participant in the tech industry and as a part-time marketing professor for a number of years now, field testing of products is generally of great interest to me. Having been involved personally on many occasions, I was aware of the value and insight that can be gained, even with implementation challenges and the risk of hearing news that is not necessarily what was hoped for. The release described the arrangement somewhat idealistically as can be expected, as follows: “The two organizations will work collaboratively throughout the course of this [three year] engagement to maximize the experience for all involved. 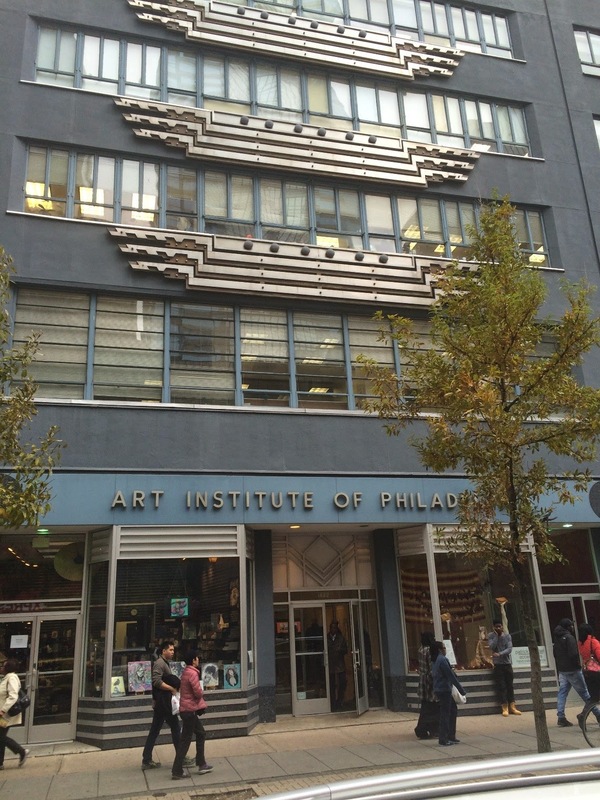 This will include regular feedback from The Art Institute of Philadelphia’s staff and students on their experience with the C941dn, as well as ideas for expanding the device’s capabilities.” Just the idea of getting “up close and personal” with users, finding out their likes and dislikes about the product in question, and really getting into their heads is a hallmark of good marketing and customer understanding. My Visit – Extreme Enthusiasm and the White Toner is ‘Blowing up’! I was very impressed by the enthusiasm of both the students and professors for the C941dn from OKI Data, which they had been exposed to since August. The five students and one professor who joined me for a group session brought numerous examples of their work. As can be seen in my photographs, they all brought examples of their work using the machine’s “white toner” capabilities. This, of course, provides much more flexibility in printing on dark-colored stock, and invites a lot of experimentation. 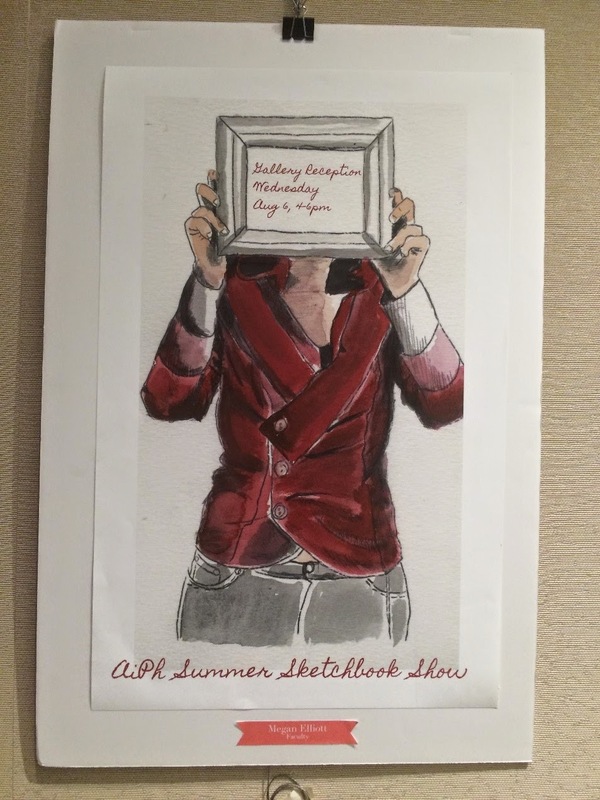 In their professor’s words, “It's the white toner that's just blowing up,” or, as a baby boomer like me would say, “The white toner capability of the C941dn has led to the students exhibiting a great deal of creativity and enthusiasm”. One of the other features of the printer (see this article for more details), the clear toner, which offers the ability to put a shiny surface on top of an otherwise conventional print job, seems next on the list for the students to try. And process-wise, the C941dn’s presence in their classroom as a means to test-run pages prior to sending to their in-house service bureau was unanimously popular as a step- and time-saver. And just the easy access and openness to experiment (credit to OKI Data and the Art Institute of Philadelphia) has clearly made the collaboration a big success in just the first months of its three-year commitment. From my brief visit, I believe this has been and will continue to be a very successful collaboration and that at least for the graphic-arts world, OKI Data has a huge market opportunity with its robust C941dn (and no doubt models to follow), with the white and clear toner features as real differentiators. (I’ve posted a look at white toner in a guest blog at Actionable Intelligence – add link.) Back to the field testing, though, I owe great thanks to the Art Institute of Philadelphia’s administration, faculty and students, as well as OKI Data Americas, for the tremendous access they offered me. I know I've pulled the "Ten Years After" classic-rock reference out in the past, but this time it really fits! On the continuing theme of my previous post, "While I Was Away", I am late getting up a link to my quarterly results spreadsheet for HP's Printing unit. Once again it was a solid if unspectacular quarter, assuming "solid" means low-single-digit year-to-year percentage declines across the board. For those counting, it's now been 15 quarters since the former IPG has posted a non-negative percentage "growth" number for total revenues. Now, to the Ten Years After part! While researching another blog post (coming to a screen near you very soon!) I discovered a reference in the August, 2005 edition of The Hard Copy Observer. Since we are coming up on 2015, this makes it essentially ten years ago, when the front-page article quoted former IPG chief Vyomesh Joshi as follows, "...Joshi said he expects HP to double its printer business over the next 10 years from $24 billion in annual revenue currently to $50 billion— quite a tall order for a company that saw a 6 percent dip in revenue growth for the quarter that ended in April compared with the same quarter in 2004." While technically the forecast has another year to be measured, interpreted quite liberally, HP closed out FY2014 with revenues just a shade under $23 Billion, at $22.979 Billion to be precise. Note that this figure comes short not only of the ten-years-out projection of $50 Billion, but also the baseline FY2004 revenue of $24 Billion. The profit picture, in fairness, is quite a bit better (the article refers to profit margins in the 14%-16% range back then, with margins over the last 12 quarters ranging between 16% to nearly 20%), meaning HP is bringing in more profit dollars than ten years ago, even with revenues slightly less than back then. This is not so much about our industry leader HP, but more a reflection on ten years of time in a tough environment for a industry facing numerous challenges. I spent the end of October and the beginning of November away. I was off on a long-planned, once-postponed vacation/exploration, going to places I had never been before, seeing some sights I had always wanted to see, and doing it all with a group of family members with whom I had never before traveled for any length of time. And it was great. But as might be predicted, I did miss a few things! 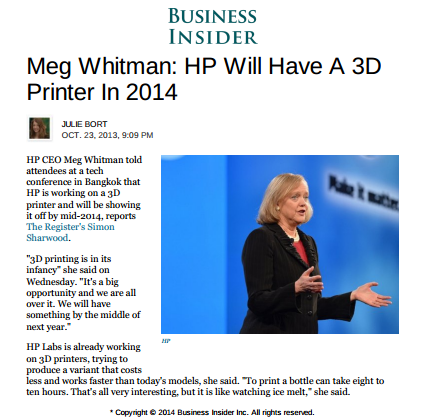 The big miss (for me) was not being among the connected for the HP 3D Printing announcement on October 29. After much anticipation, HP unveiled its homegrown Multi Jet Fusion technology. 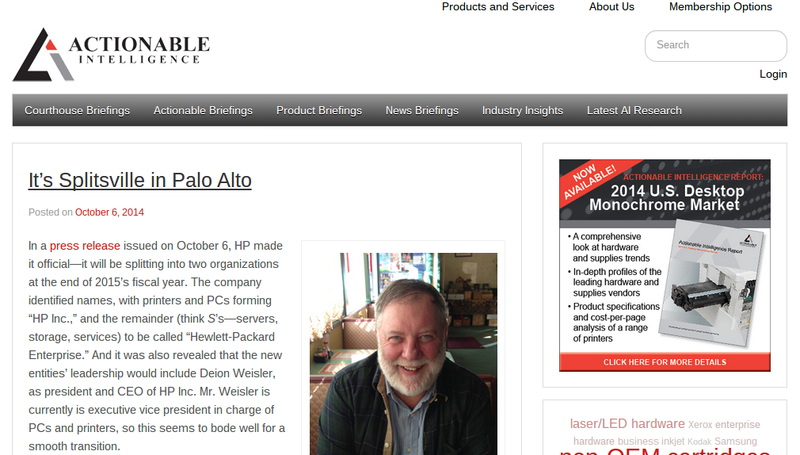 (If you missed it, read the news release and two excellent backgrounders by HP). That anticipation came partly from the seemingly “natural” fit for HP in the burgeoning 3D printing world. With much of printing and imaging flagging, growth-wise, 3D printing has been a poster child for an exciting new (but related) industry of the future. And starting with the “printing” in its name implying rampant opportunity for print-industry leader HP, and further reinforced by the firm’s treasure trove of intellectual property in the inkjet arena, a technology fundamentally, shared between conventional printing and the creation of three-dimensional objects. As a viable, new business opportunity for the industry, I don’t see it as the next big idea because of the long term research and development needed. It reminds me of HP’s entry into commercial printing and graphics art – though it seemed like a no-brainer to some, the overlap was much smaller than one might imagine. It came out well eventually, but it took much more work and more time than we originally imagined. And in addition to those stock traders who found the portent of industry disruption in the HP news, what did others take from the reality of the company finally entering the 3D printing business, albeit with products still to come in future years? From Re/code, Arik Hesseldahl, whose work I admire, puts together his case for HP’s commercial prospects for its 3D printing future in this piece. Others like The Guardian had a bit of fun with it. 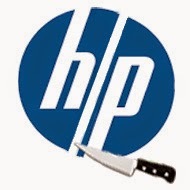 And while I had blogged about HP’s potential in the business as long as five years ago, for now I was content to bring out an interesting naming “coincidence,” at least according to my HP sources. The software portion of HP’s announced solution is Sprout - the same codename given to the original LaserJet while in development, and whose 30th anniversary we are celebrating this year. This 30 years of printing success is a legacy cited in the case for “why HP” in the company’s 3D printing materials linked to above. 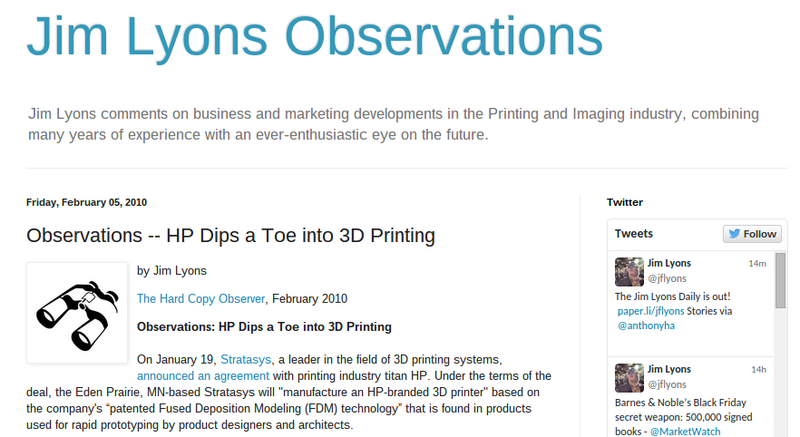 I borrowed from the title of the first chapter of Thomas Friedman’s 2005 book The World is Flat ("While I was Sleeping") in naming this post, rather than going with something like “HP 3D Printing Launches - Will Market Success Follow?” In recapping my monthly "Observations" some time back, I realized with some consternation that a large portion of my posts were titled, a la the famous TV game show "Jeopardy," in the “form of a question." I worried - should a column entitled "Observations" be making statements, or offering queries? (And see, there I go again with the question mark!) And as far as the recapping process, I should note this is the post completes nine years of monthly "columns" - with my first one appearing in The Hard Copy Observer in December 2005, linked to that aforementioned departure from HP. So it's thanks to my readers, editors, and publishers alike, and on to Year Ten! Jim Lyons has been writing, analyzing and blogging about industry developments since 2006. In his monthly Observations column he comments on business and marketing developments in the printing and imaging industry, combining many years of experience with an ever-enthusiastic eye on the future. In the Jim Lyons Observations column on The Imaging Channel, highlights from that blog appear monthly. Lyons is also a faculty member at the University of Phoenix, teaching marketing and economics at its school of business, and is a regular contributor to both The Imaging Channel and Workflow. Follow him on Twitter @jflyons and read more of Jim Lyons Observations at http://www.jimlyonsobservations.com/. Great news! 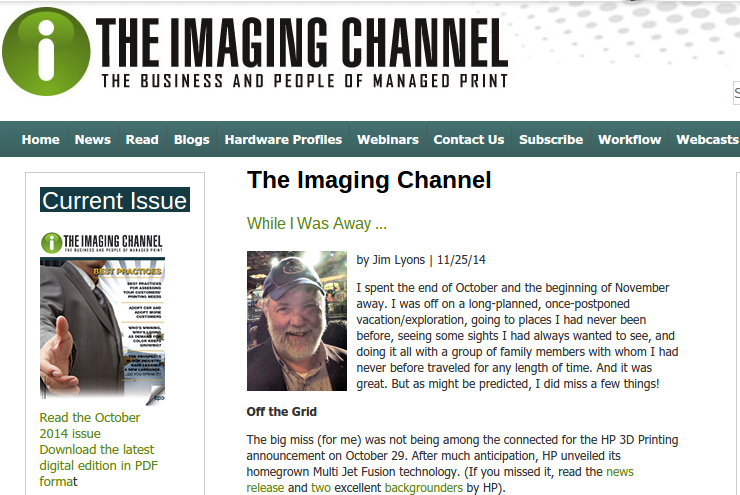 My friends at Imaging Channel beat me to the punch this time, posting my November Observations, "While I Was Away", before I can get it up here (yes, I am away AGAIN). So accompanied by my wish of "Happy Thanksgiving", I encourage you to visit their site and read my musings on HP's recent 3D Printer announcement. HP’s Split - Is This My Long-Awaited Book Project? Could the HP story make for a Larson-esque book? In some ways, the HP business decision to cleave its business into two, including putting the printers and PCs in the newly formed HP Inc., is similar to the topics Larson takes on. 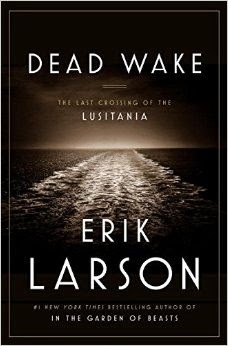 He describes his method as finding an interesting story from the past that has been of high interest at the time of its occurrence. This high interest assures a plentiful historic record for his research. And then once research is complete, his writing goal is to “animate history,” weaving the tale together with multiple historic threads which put the tale all into fascinating perspective. So if I were to take on a Larson-style book project on this HP saga, would it qualify, and what threads, if there is an adequate supply, would I want to include? As I have mused on this during the last few weeks, though I am not sure I am up to writing the book, I am sure there are enough interrelated sub-stories out there to make a go of it. 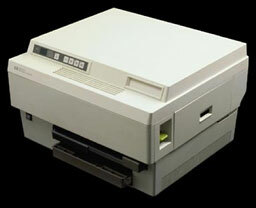 Certainly first on my list would be the documentation of the decades-long success of HP’s printer businesses. This would include the very strong culture, with descriptions and examples of how its employees were the risk-oriented, “mavericky” (to borrow a word from the 2008 presidential campaign) types who reveled in independence from the rest of HP. Those independent souls I knew and worked with back “in the day” are now long gone, at least for the most part. So the split-off of 2014 may have come 10 or 20 years too late. And what of being joined with the PC group? This would not have gone over well back then, but today, things have changed, in terms of strong-minded employees with deep-seated rivalries. And then what about current HP CEO Meg Whitman and her history? This account about Whitman would have to include her stint as CEO of eBay, and much could be made of the parallels of that company’s splitting off PayPal, announced days before HP’s split-off plan. Of course, then I could drill down on the “PayPal mafia,” a group of entrepreneurs who founded that company prior to its original acquisition by eBay. This group of now-very-wealthy Silicon Valley residents, led by the brilliant and controversial Peter Thiel (pronounced "Teal", as in the duck), could easily fill a chapter in the HP story. A Marc Andreessen backgrounder (chapter?) would be a must, too – another great personal history leading from the founding of Netscape to powerful Silicon Valley venture capitalist and board member at the current HP. These current-day Valley references could then all be contrasted to the environment in 1939 when, by most accounts, Silicon Valley got its start in Bill and Dave’s garage. And back to Whitman – this late-2014 story has to be told in the context of the history of HP CEOs, going back to the Bill and Dave days, and leading up to the company’s dramatic rise in the 1970s, 1980s and 1990s under their protégé, John Young. Following Young, it was the last of the home-grown leaders, Lew Platt, who had his own successful spin-off with Agilent. The procession of outside CEO talent then began with Carly Fiorina, whose tempestuous Compaq acquisition brewed the first scheme for a printer business split, led by Hewlett scion Walter. During her final days, she instigated and announced the first internal merger of PCs and printers, but Mark Hurd replaced the failed Fiorina and almost immediately reversed the PC/printer decision, keeping printers independent, and he went on to a few years of iron-fisted leadership that seemed to right the company but was capped by a quick demise under the cloud of an expense-report scandal. Whitman’s immediate predecessor Léo Apotheker followed Hurd with a brief year-long tenure, including a PC group spin-off (or sell-off) idea of his own that contributed to his ouster. And then there’s more, which may or may not hit the cutting room floor. There’s the whole story of the highly profitable ink (and to a lesser degree, toner) business that despite (or because of) its high margins, seems to be managed like the proverbial “cash cow.” It would be important to discuss that “cash cow” is actually not from a proverb at all, but rather the 50-year-old creation of the Boston Consulting Group, so some of that management-philosophy story could make a very interesting chapter. And some other individuals play an intriguing role in the tale. One of them is current HP board member Patty Russo, who plays a major role in the new dual-company organization that was announced on October 6. She has a fascinating bio of her own, crossing paths with Fiorina during their mutual careers in telecom, then playing a significant if unsuccessful role in the failed management of troubled Kodak, a company whose story could make a perfect example of HP printer-business roadkill. This post is definitely making me think there’s a book possibility here. But back to Larson’s point about the story being highly interesting during its time? Although for me personally and for our industry and Wall Street, it’s a big deal, I am not sure about how it plays more broadly – as long as I looked on Sunday the 5th when it leaked, and then Monday the 6th when it became official, “HP” was never even trending on Twitter – and isn’t that modern-day definition of high public interest? I've shared my initial thoughts on the long-anticipated HP split, in a post generously hosted by Actionable Intelligence. Stay tuned here for some further analysis in the next few weeks.